New HGV registrations decline -4.3% in 2018, with 43,103 vehicles joining UK roads. 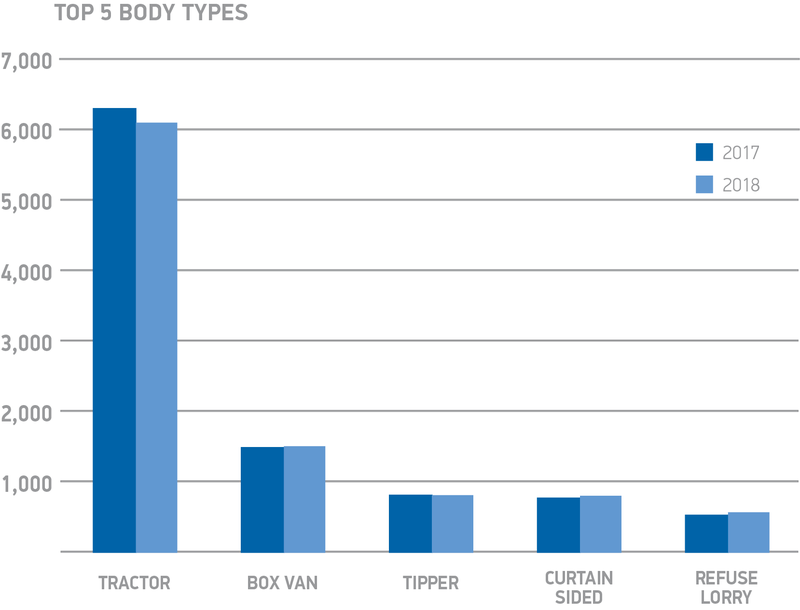 Demand grows for tippers, skip loaders and flat lorries, bucking overall trend. Markets for both rigid and artic trucks decline, down -6.7% and -1.1% respectively. The UK new heavy goods vehicle (HGV) market declined for a second year in 2018, down -4.3%, despite an uptick in the fourth quarter, according to figures released today by the Society of Motor Manufacturers and Traders (SMMT). 43,103 heavy trucks were registered on UK roads last year, almost two thousand fewer than in 2017. 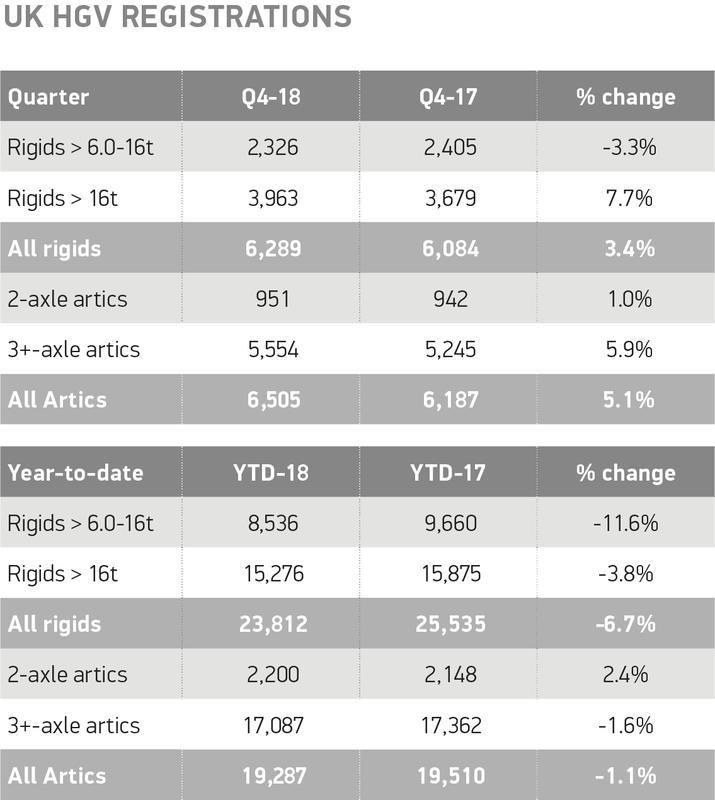 Registrations of rigid trucks declined -6.7%, driven by a double-digit fall in the >6-16T segment and a smaller -3.8% drop in demand for trucks >16T. Elsewhere, the market for articulated heavy trucks also declined, down -1.1%, as 19,287 models joined UK roads, while 2-axle artics enjoyed a +2.4% boost in popularity. In 2018, tractors remained by far the most popular segment, taking 44.5% of the market, with demand staying broadly stable year-on-year, down just -1.3%. While box vans ended the year down -16.7%, tippers, skip loaders and flat lorries bucked the overall trend, with all seeing single digit growth. Despite the natural fluctuation in fleet buying cycles, the second consecutive annual fall in new HGV registrations is a significant concern. Business confidence is absolutely critical if companies are to invest in the latest, low-emission trucks in 2019, and with ongoing political and economic uncertainty and fewer than 50 days until we leave the European Union, we need stability now more than ever.